Golf is a challenge to your skill, stamina and temperament and all three will be tested before you reach the eighteenth green at Bull Bay Golf Club. 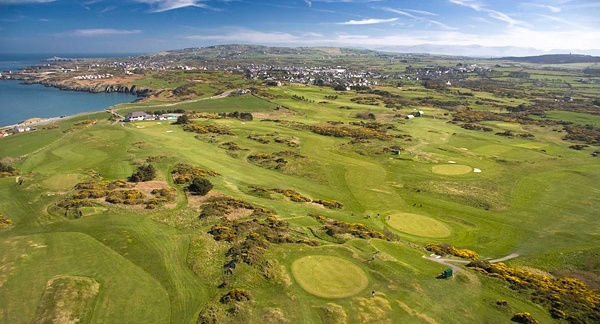 Every hole at this North Wales club has its individual appeal, the flat, the hilly , the dog-leg and the blind approach to the green, but each one is fair and well within the grasp of the average golfer. The course at Bull Bay is known simply as “natures gift to golfers” and offers views of some of the best scenery in the country – from the wide serve of the bay to the Irish Sea and the Isle of Man (on a clear day! ), to the mountains of Snowdonia across the green fields of Anglesey. This headland course which sits high above the Irish Sea. Enjoying spectacular views on a clear day to the Isle of Man and the faraway Cumberland hills. The holes run up, down and across a sloping headland which boasts little in the way of vegetation save for the odd patch of gorse. This is a genuine hidden gem of a course, well worth seeking out as much for its setting as its challenge. There is nothing pretentious about BullBay. There is honest down to earth golf here and great value green fees too. The courses setting, high on the headland leaves it exposed to the full force of the wind off the Irish Sea, which abates only seldom in this part of the world. but its honest golf and if the need to wrap up is more common here than in other places, the overall experience is well worth it. Enjoying spectacular views on a clear day to the Isle of Man and the faraway Cumberland hills.